SINGER is a trusted manufacturer of sewing machines. 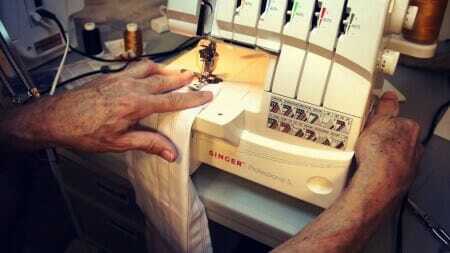 Most of us probably learnt how to sew on an old SINGER owned by our mothers or grandmothers. 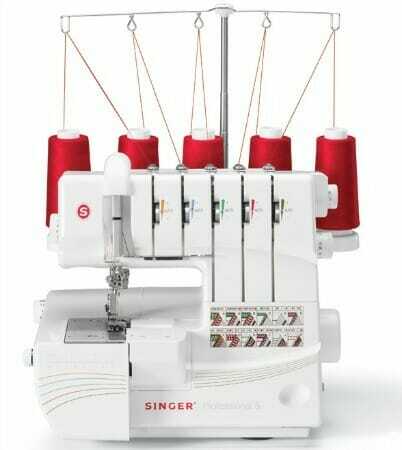 As times have progressed, so has SINGER in their technology and now they have brought to us the SINGER 5 thread serger. Sergers are similar to sewing machines but they trim your fabric while you sew. Sergers are also able to make much more professional looking seam edges and with the SINGER 5 thread serger, you won’t be stuck for variety when it comes to seams. Able to complete 1300 stitches per minute, you can expect professional results in a much faster time frame with this serger. The turnover of all your sewing projects will be so fast, it’ll feel like you’re crawling at a snail’s pace when you switch back to your regular old sewing machine. With all its technological features, you’ll be amazed at how easy it is to serge. SINGER has really tried their best to simplify the whole process for you and this serger is the result. The ability to use 2-3-4-5 thread for this SINGER is a big tick in the box for many happy reviewers of the SINGER 5 thread serger. This allows for a greater variety of stitches so that you can always pick out the right stitch for any project. 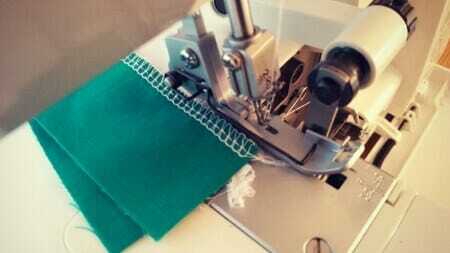 It also allows the SINGER to perform a coverstitch on your projects, which is a feature most sergers do not have. This is great because most people will need to purchase a separate machine for coverstitches but with the SINGER, you can have it all in one place. Including 4 built-in rolled hems, reviewers enjoy the ease with which they can convert to rolled hem mode. All you need to do is use the designated lever and the machine will move the stitch finger into position for you. Who hasn’t had trouble with finding the correct tension when using a new type of fabric? The SINGER will automatically adjust the tension for you to ensure balanced and even stitches no matter what type of fabric you’re using. Instead of spending time testing out the thread tension with each new project, the machine can do it for you. Sure, it’s not an absolutely must have feature of a serger since it’s not difficult to manually adjust the tension. But some reviewers have found that it definitely saves a lot of time, rather than running tests on each of the 5 threads and checking the 10 different tension settings. That’s 50 tests you’ll have to perform and a lot of scrap fabric that you can save with an automatic tension adjuster setting. Everyone should be able to enjoy an easy threading experience and now you can with the SINGER 5 thread serger. Reviewers are pleased with the easy to follow diagram that’s color coded so that you can keep track of all your threads. Sergers trim fabric while you sew. All this excess fabric has to go somewhere and naturally, it’ll fall onto the floor or all over your table, cluttering up your work area. It also means a lot of clean up time afterwards with the sweeping. SINGER solves this problem by providing an attachable waste catcher. Clip it on and all your scraps will end up in the bin without any effort from you. The SINGER also comes with plenty of accessories, including a multitude of bonus presser feet. These extra presser feet can be used to increase your creativity and allows you to expand your repertoire of skills. Due to the complexity of 5 threads, this SINGER serger may not be suitable for beginners of serging. While the serger does come with an instruction manual, it is just a brief guide so it will not be of much benefit to beginners. Hence the reason for the serger being unsuitable for beginners. There is a workbook available for purchase online that complements the instruction manual and many reviewers highly recommend you do your homework before starting up the serger. Even advanced users of serging sewing machines struggled to use the machine without a bit of study. 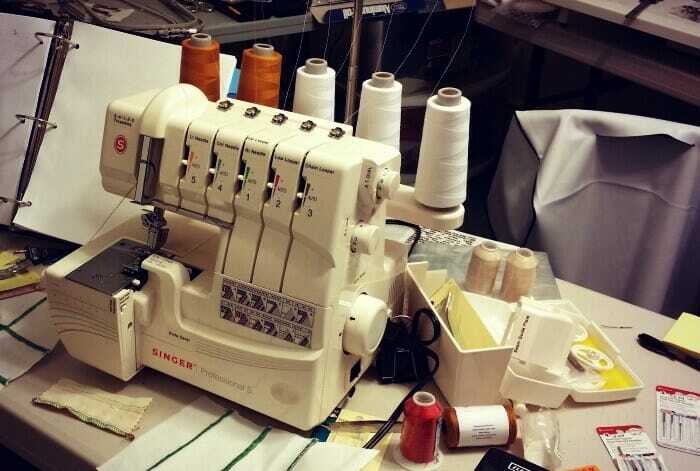 However, if you are a beginner and start learning on the SINGER serger, you will find that as your skills develop, you can learn the more complex server stitches on this server rather than purchasing a new one. This flexibility allows you to grow into your server and will save you money in the long run. The 110V machine is designed to suit the voltage in the United States and Canada. So, if you’re needing to use this SINGER in another country with a different power output, you’ll probably need a step up or step down transformer. After all, you don’t want to accidentally fry your serger just because the voltage outlet in your country is a lot higher than in the US or Canada. This could be an additional cost to you, depending on whether or not you already have a transformer or voltage adapter at home. There are plenty of things we absolutely love about the SINGER 5 thread serger sewing machine. With its heavy duty metal frame, if this serger is treated with care, you can expect to receive many years of use from it. At a price of under $500, this is a bargain for a serger that can easily adapt to all your needs for sewing and also as your skill set grows. 5 thread capability is not particularly common, especially at this price so this is an opportunity you don’t want to miss out on. The SINGER 5 thread serger sewing machine is the best serger for under $500. 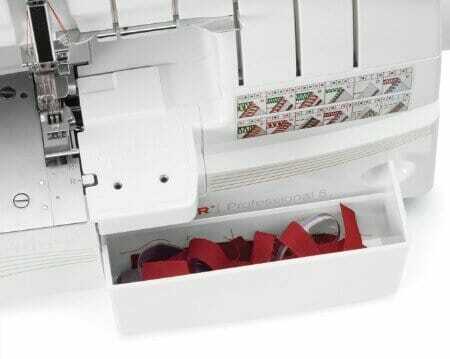 SINGER packed this machine full of all the components necessary for high quality serging and this serger doesn’t fail to deliver on those points. Given its flexibility, it is definitely worth investing in for intermediate to advanced sewing enthusiasts. Just make sure you read the instructions carefully before your first use to prevent frustration.